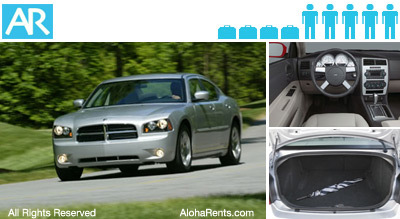 Presenting the 4-door Charger is considered a full-size rental car. This modern coupe has lots of room for 5 people and enough room in the trunk for all your luggage. The interior is luxurious and well designed. Always-on LED daytime running lights, comfortable seating, front and rear power windows with express front up/down, full-color 7-inch driver information display.